A large stone with two words "Livingston Academy" engraved on it is all that remains of the former building that saw countless numbers of students come and go through its doors, and that stone now rests on school property where the present building that houses Livingston Academy is now located. The class of 1953 is responsible for the saving and locating that stone to where it is now, and on July 25, 2003, that class will gather for their 50th reunion. The year this group graduated, the faculty included Thomas Parrigan, Superintendent of Schools and Kenneth Watlington, Principal. The teaching staff included: Alvin Vaughn; Jeanette Smith; Margaret Miller; L.E. Oakley; Margret Frasier; Edward Miller; Margie Parrott; Mrs. Allene Deck; Elmo Swallows; Albert Smith; Evelyn Oakley; Rose Hart Dale; Beryle Little; Martha Copeland; Kenneth Stephens; Roxie Ledbetter; Arley Poston; and Evie Tucker. Seventy-one members graduated in that class, and it was the first class to graduate with boys in blue robes and girls in white. Both girls and boys of previous classes had all worn blue robes. Several boys out of that class were drafted and left for service prior to receiving their diplomas. Jeanette Smith was valedictorian and Dorothy Goodpasture was salutatorian. Thirteen members of that class are now deceased. Class officers in 1953 were: Gentry Ledbetter, President; Ferrill Gunter, Vice-President; Geraldine Martin Burton, Secretary; Peggy Copeland Wood, Reporter. Senior members of the football team were James Kuykendall; John Sadler; Houston Evans; Sam Brooks; Bobby Beatty; and Glenn McDonald. Senior basketball players were Lyndell Winningham Arney; Bill Winningham; Onita McDonald Windle; Harold Dale; Sam Brooks, Jackie Jolly Winningham; John Sadler; and Betty Hawkins Parsons. Those chosen for various awards from the senior class as well as other classes were: Most Poplar: Harold Dale and Judy Copeland Evans; Best Citizens: Ruth Ann Eubank Hunter and Gentry Lebetter; Best Athletes: Betty Hawkins Parsons and John Sadler; Best Looking: Bill Winningham and Barbara Wright McConnell; Most Representative Seniors: Gentry Ledbetter and Paul Buckner; and Jo Ann Mitchell Simcox and Mary Stout. Most Studious: Carole Roberts Winningham and James Flatt; Most Likely to Succeed: Cecil Conner and Dorothy Goodpasture. The class trip that year was to Fontana Village, North Carolina. To cover the expenses for the trip, members sold magazines and a birthday calendar was prepared that also helped raise money for the trip. Class sponsors were L.E. Oakley; Kenneth Stephens; Evie Tucker and Beryle Little. The trip to North Carolina was made on two school buses, and somewhere along the way, one of the buses ran into the back of the other bus, but luckily, no one was injured in the mishap. The group stayed in cabins during this three or four day trip, and enjoyed a cookout one night before returning home. A dance called the "Bunny Hop" was poplar during this period of time. Tragedy struck during the 1953 school year with the burning of the gymnasium at Livingston Academy. Anyone who lived in or nearby the town of Livingston was probably in the large number of people who stood and watched as the building went up in smoke. The school annual for that year included a drawing of the new proposed building that was later constructed in the same location where the one that burned had stood. A lot of information for this article came from the 1953 edition of The Chieftain, the name that was given for the high school annuals at Livingston Academy. After looking through this particular annual, I had to wonder if anyone has any idea of how many annuals Mr. Arley Poston did his creative script type handwriting in by printing the name of the owner of the annual on one of the front pages. An annual just wasn’t complete without Mr. Poston’s truly unique handwriting of a student’s name, and it turned out to be a good way to remember him by. 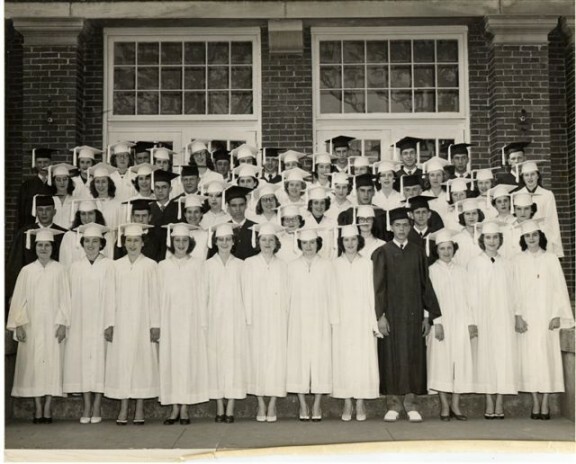 I know that the members of the Class of 1953 of Livingston Academy are excited about getting together to celebrate their 50th reunion just as my class who graduated some ten years later did when we recently held our 40th reunion. And after attending that reunion and reliving some wonderful memories, I’m even more convinced that the 50's and 60's were the best of times to grow up in, and an excellent way to recapture a few moments of those days is to attend a high school class reunion. The Class of ‘63 gathered together on July 5, 2003, at the present Livingston Academy building, a building to which the members of that particular class have no ties as far as attending high school there, but what a wonderful time we had! Some of us hadn’t seen each other since graduation. Only one of our teachers was present, and that was Willie Hugh Bilbrey. It’s hard to describe the happiness and joy that is present at such gatherings. Ours was a class that wasn’t any different I’m sure that others who went before us, in that we became a large family as we went through the twelve years of achieving a high school education, and it felt good to have at least a pretty good number of that family back in each other’s presence once again. We’ve probably all heard the many reasons that are often used for not attending a reunion, and we may have even used any one of these excuses for not going, such as "I might not know everybody", or "I might not know anybody", or "I don’t look like I used to and I would be embarrassed for my classmates to see me like I am now," or "the members of my class I care anything about I see from time to time without going to a reunion." If you want to deprive yourself of a good time, you can tell yourself any of the above excuses, and I promise you, you will miss out on an opportunity to walk down memory lane with some of those who were there beside you at the same time, experiencing life at a time that we now look back on as being the very best years of times. And when it comes right down to it, no one really cares who has a gained a few pounds, or who has a lot of gray hair, or even who doesn’t even have any hair at all, it’s a wonderful feeling to be together again with members of a group that sat together in classrooms for what seemed an eternity back then as we prepared for what might lie ahead in the future. Regardless of what we’ve each accomplished with our lives, we were a pretty special group of kids, growing up during what we consider a very special time. One of our members said it all at our reunion by telling us that " I wouldn’t go back and change a thing about how we grew up." We had a good life, and the memories we share are priceless. So when your next reunion rolls around, don’t cheat yourself out of a great time. I promise you, you won’t regret it. I would also like to request the help of my reading audience and ask that if anyone knows how the word "Hogeye" became a tradition at Livingston Academy, I would like to hear from you. I’ve done a little bit of background research, and I can’t seem to find anyone who knows for sure how that got started. If there is someone out there that might have information, I would certain appreciate your contacting me. I can be reached as follows: Josephine’s Journal, c/o of The Overton County News, P. O. Box 479, Livingston, TN 38570; email address is: emily@josephinesjournal.com. A review of my previous stories can be found on my website at www.josephinesjournal.com.